Are you looking for a high quality, low cost Cultural Arts Assembly for your school, but don’t have the funds? Here is your answer!! The Fremont Cultural Arts Council knows that funding for arts education is a challenge at our community schools, and perhaps even more critical, school staff just don’t have the time to research, select and engage a worthwhile assembly, one that will enthral the students and fit in with mandated education guidelines. Through our Cultural Arts To Schools (CATS) program, the FCAC offers local schools and PTA/PTO’s an opportunity to contract for quality arts assemblies at a partially subsidized rate. 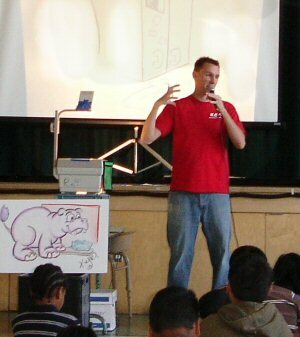 Case in point–in the spring of 2008 we sponsored a series of interactive drawing assemblies at several local grade schools. Feedback from parents and teachers on this program has been outstanding, and we are considering a repeat in addition to evaluating other quality arts-related assembly programs. 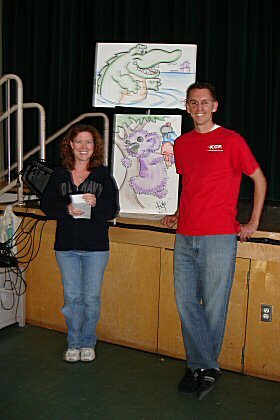 CATS assembly organizer Tricia Schoner with Kyle Tiernan. 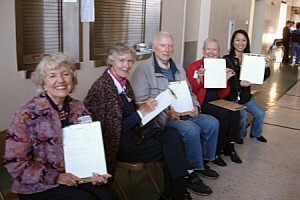 A few of the FCAC board members show off their drawings.